Gom (HoneyWorks) - Zen Zen Zense · forums · community | osu! 00:09:716 (1,2) - why nc here? [Normal] -ye i change it! i actually quoted this time. thanks for mods!! im not good at English. 00:06:874 (5,6) - bad flow. plz more distance. 00:00:243 (1,2,3) - Starting out a map with a spaced triple like this is a pretty strange idea. It provides extremely strong emphasis to... nothing in particular? 00:02:769 (1,2,3,4,5) - This is horribly overmapped. Half of these don't even have notes on them, and spacing it out this much really overdoes it too. Generally overemphasizes beats that may or may not actually exist. 00:03:400 (7) - Why use a repeating slider here? 00:03:558 - is a perfect chance to put down a triple or something, because it's the strongest part of the slider there, but not actively emphasized at all. 00:05:927 (3,2) - This is some pretty careless overlap. 00:07:506 (6,2) - These sliders could cooperate more. As it is now, they just look copy+pasted and rotated, but you could try rotating 00:07:506 (6) - to better blanket them. 00:08:295 (3,4,5,6) - Why are you contradicting implied flow here? 00:08:927 (7) - What's up with these funky slider shapes? You really go all over the place with these throughout the map and I can't seem to figure out why. There are no odd sounds that they emphasize, they seem random, and are generally inconsistent. Are they just slider 'art' for the sake of it? 00:10:348 (3) - Same problem occurs here - simple sounds merit simple sliders. If you were using this sort of slider for the whole map, sure it'd be fine, but as it stands now, this is just random. 00:13:979 (1,3) - If you want a curved slider, you only need a single grey anchor and it'll turn out smooth. These just look imbalanced and unfitting. 00:15:400 (1,2) - The way they look and the way they play, these sliders are too long and too fast to be this close to each other. 00:17:927 (4,8) - They just get weirder the further into the map you get. 00:21:558 (1) - But wait! There's more! 00:24:874 (4,4) - I've said as much as I can about these sliders. Basically, what the hell? 00:01:821 (2,3,4,5,6) - This part has some weird flow issues. While 00:01:348 (1,2,3,4,5) - flows well and does a good job of increasing spacing in a visually acceptable manner, 00:02:453 (6) - contradicts all implied flow and then stops flat. Generally seems uncomfortable to play for no particular reason. 00:06:243 (4,1,2,3) - This part has the same problem: 00:05:927 (3,4,1,2) - flows well, then transition into 00:06:716 (3) - is totally out of the blue and contradicts all implied flow in favor of a zig-zag form. If you were just changing directions of circular flow that'd be fine, but it doesn't seem like you actually have circular flow in this map. 00:11:927 (2,3,4,5,6) - The linear movement in 00:12:243 (4,5,6) - is totally out of the blue. The player hasn't seen a single movement like this for the whole map, and even if said map is extremely short, that's all the more reason to be consistent - not all the more reason to throw as many different ideas in as you can. 00:17:295 (6,1,2,3,4) - The flow in these jumps has a different problem: there is none. It's just up-down-up-down. Are you sure this is the sort of movement you're going for? Especially in the way it's presented after the long slider, the movement tends to be quite jarring. 00:21:558 (1,2,3,4,5,6,1) - Just saying, these are really the only jumps in this whole map with consistent circular flow, and half the map is jumps. 00:15:321 - Going back a few seconds, this is the perfect place for a triple, yet it seems to go wholly ignored. Why? 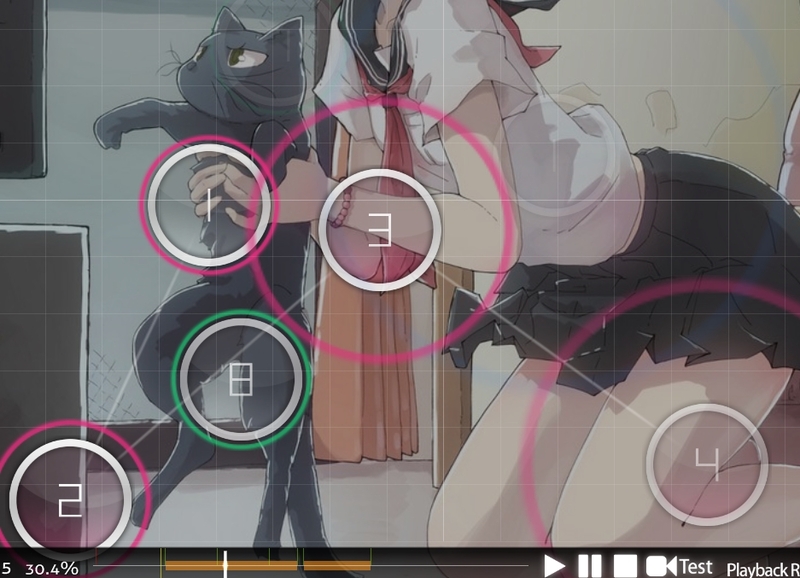 00:16:032 (3) - Not only does this slider not really fit in in a section full of curved sliders, but this is one of the few places where the instrumental actually makes it reasonable for you to use 2 circles here instead of 1 slider. 00:16:979 - The repeat slider here (that seems to be a bit of overkill) totally ignores the drum on this beat. 00:19:664 (1) - Out of all of the grossly overmapped parts of this song, I have to say this is the worst. For one, the "mou" lyric that starts here is somewhat delayed, so the player is getting feedback for something that hasn't actually happened yet. Beyond that, you are switching between instruments (not a good idea at all in the middle of a section unless you really know what you're doing) so this note is practically mapped to nothing. 00:20:295 (1) - Due to Japanese people sucking at using time signatures correctly, you correctly place plenty of downbeats before or after the big white tick on the timeline. In this case, however, the downbeat indeed falls upon that tick, yet it is entirely ignored and is right in the middle of a slider. That's a pretty big no-no. 00:22:821 (1) - See above. Ignores a downbeat, starts on vocals instead. 00:24:874 (4) - This slider ignores a beat in the middle too. 00:26:611 (5) - This seems horribly undermapped. This entire slow section doesn't follow the music at all. Overall: could use work. You might want to come back to this with more experience in mapping. The way a lot of this is executed seems to disregard the concept of visual distance, and thus looks messy. Some places, you ignore beats, and some places you swap between the vocals and the instruments. This makes for a map that feels like it doesn't follow the song and is just looking for beats to put as many jumps on as possible. 00:00:243 (1,2,3,4,5) - Generally this movement is going to be pretty uncomfortable. Not only is the distance between active objects constantly different, but it also uses wide angles that players don't often see, especially not so suddenly as the song begins. 00:01:032 (5,6,1) - This is a huge jump. Especially for an Insane diff, at 190 bpm, that goes on for 30 seconds. Then, it goes on to contradict this massive amount of movement with a kick slider in the other direction which messily overlaps with a slider, stopping flow once again, creating a section of movement that is generally uncomfortable for the player. Remember, kick sliders mostly just play like regular hit circles, so you can always just try something like this. It plays much more easily and feels a lot less sloppy. 00:02:769 (1) - In reference to the top diff: this is the right way to map this part using passive emphasis. 00:03:400 (3) - Despite what the timeline may say, it deceives you with its evil lies. The end of this slider is actually stronger than the start, and since sliders should start on strong beats and end on beats of equal or lesser strength, this should probably not be a slider at all, but rather a circle followed by a kick slider. 00:03:874 (1,2,3,4,5) - This is generally pretty messy. It uses tons of different slider shapes for no reason, and has some pretty messy, poorly thought out overlap that makes it look somewhat random. It also uses spacing that makes it hard to read the rhythm. 00:06:400 (2,3) - Instead of 2 hit circles, this should probably be one slider. Try to consistently follow a single instrument track, or switch them when the music necessitates it. 00:07:032 (6) - This slider starts on vocals and ends on a strong beat on both the drum and secondary guitar, which is poor emphasis. 00:08:295 (6,7,8,9,1) - Instead of what it is now, why not try to make this consistently curve? 00:12:085 (3) - Again, starts on vocals and ends on a strong beat on the drum. 00:12:716 (6) - There's nothing on this beat, so there shouldn't actually be any note there. 00:17:453 (1,3) - There's no real reason for these to be kick sliders. 00:18:401 (5) - You know what I said about starting on vocals and ending on strong drum beats?... you didn't when you mapped it because I hadn't actually said anything yet, but you know now. 00:18:716 (6) - This one starts on a regular drum beat and ends on a really strong one. 00:20:295 (1) - Starts on vocals and ends on a downbeat. That's where it starts to be a real problem. 00:21:399 (6,1) - Try to distance the circle from the body of the slider in the same way that 00:21:084 (4,5,6) - are distanced. 00:23:137 (2,3) - Uses really weird overlapping where it's not stacked in a way that looks intentional and the visual distance between 00:22:821 (1,3) - is just too weird looking. Too many instances to detail in this mod: slider consistency is your friend!! Try to use the same slider shape to represent the same sound. It will make your map look much more solid and much more consistent. Use ctrl+C to copy, ctrl+V to paste, and ctrl+shift+R to rotate. 00:00:243 (1,3) - Right out of the gate, I can tell you need to work on your slider consistency too. Why would you use 2 sliders to do this when you can just as easily use the same one and have it look much, much nicer? 00:01:506 (1) - This note is mapped to absolutely nothing. 00:03:243 (2,3,4,1) - I struggle to understand why you used hit circles (active emphasis) on quieter guitar notes and a long repeat slider (passive emphasis) on much ,much stronger ones. 00:06:558 (1) - The timeline lies to you! The downbeat here actually falls on the red note before the big white tick. Map to the music, not the timeline - especially in Japanese music, lots of times they use downbeats on the red tick before the downbeat would usually be. And often (like in this song), they switch back and forth between correct and incorrect downbeats. The only way to tell is with the song. In this case, there is no note on 00:06:558 (1) - . 00:07:032 (2) - This starts on a weak note and ends on a strong one. For best results, start sliders on strong beats and end them on beats of equal or lesser strength. 00:09:085 (1) - Again, mapped to nothing. There's no sound there. 00:09:558 (2) - Why is this a long repeat slider starting on vocals, instead of multiple sliders and circles starting on 00:09:716 - where there are actually instruments other than vocals? 00:10:506 (2) - This starts on little/no beat (vocals only) and ignores a pretty strong note on the drum, and ends on vocals. 00:21:400 (1) - Again, watch the downbeat. This slider starts on a medium-strength drum beat, ignores the downbeat, and ends on nothing. 00:22:821 (4) - Starts on vocals and ends on a downbeat. Bad idea. 00:26:295 (4) - This circle shouldn't exist, it's mapped to practically nothing. 00:26:453 (1) - I can't tell for the life of me what this is mapped to. It totally ignores a ton of drum beats and vocals. Now, let's talk about the actual map and not the rhythm. Fixing rhythm is essential - you can't make a good map if you don't know what you're mapping to. 00:13:821 (3) - Despite distance snapping, the visual distance between this note and the 2 sliders above and below it are distinctly different - because 00:13:979 (1) - angles up, it seems like 00:13:821 (3) - is closer to that slider, even when it isn't. There are any number of fixes to this - you can rotate 00:13:979 (1) - , you can turn off ds and manually move that slider, you can move 00:13:821 (3) - up, whatever. 00:17:295 (2,3) - Try to use the approach circle to blanket - as it stands, it's quite evident that this is an improper blanket. 00:17:453 (3,1) - These overlap in a very strange way that is aesthetically displeasing. 00:22:664 (3,4) - What's up with this super weird angle? The 1/2 slider too, both just seem so out of place here, and abrasive to play - especially for someone new to the game. Those are all the bare minimum of basic issues. I'd go over more, but I think this is enough for now. 00:01:348 (3) - This ignores a note, 1/2 before it, starts on a strong beat, and ends on nothing. 00:02:769 (1,2,3,4) - This section is generally rhythmically poorly done and has lots of bad looking and careless overlap. 00:19:821 (1,2) - Your rhythm was doing so well! What did the song do to deserve these? The drums you've followed for the whole song continue normally, so why start mapping vocals here? 1) you can use higher distance snap! This is a normal diff, not ultra beginner. They can move their cursor an extra centimeter or two across the screen. 2) Were you even using distance snap most of the time? It doesn't seem like it. 3) Be more consistent with slider shapes. Use the same ones instead of making new ones that don't fit. Thanks for this big mod! I remapped 3/4 of the map because of the flow and sliders that ignore beats. So if I just say "fixed" after a more detailed aspect I just completely remapped that part. 00:21:558 (1) - But wait! There's more! where? can't find it! 00:24:874 (4,4) - I've said as much as I can about these sliders. Basically, what the hell? what the hell! well i think i was focused too much on the vocals and forgot about the instrumental e.g. at 00:15:243 (5,6,1) - 00:20:295 (1) - 00:26:611 (5) - . Thanks for the mod again! 00:01:506 (1) - I think you're following the instrument here so maybe remove this? i go by how I feel is changeable when playing ;w; sorry!! 00:05:927 (3,4,5) - make in to this ? 00:09:874 (3,4) - something like this ? will be better ? 00:12:400 (5,6) - something likethis ?